Turbidity is a measure of cloudiness within water. When tiny particles become suspended within water, the result is turbidity. The offending substances might be minerals, oils, bacteria, algae, or any other number of things. With the aid of an optical measurement, turbidity meters help indicate precisely how many suspended particles are present. Light is shined through your sample, and then carefully measured to quantify the concentration of particles present. A higher concentration means a higher turbidity. Reading turbidity is an important benchmark for water quality, from environmental monitoring to protecting municipal water supply. In fact, the main purpose of treating drinking water is to reduce or otherwise remove turbidity. That’s why at each stage of treatment, turbidity is measured repeatedly. Within environmental systems, turbidity can indicate pollution, and may have an impact on aquatic life. 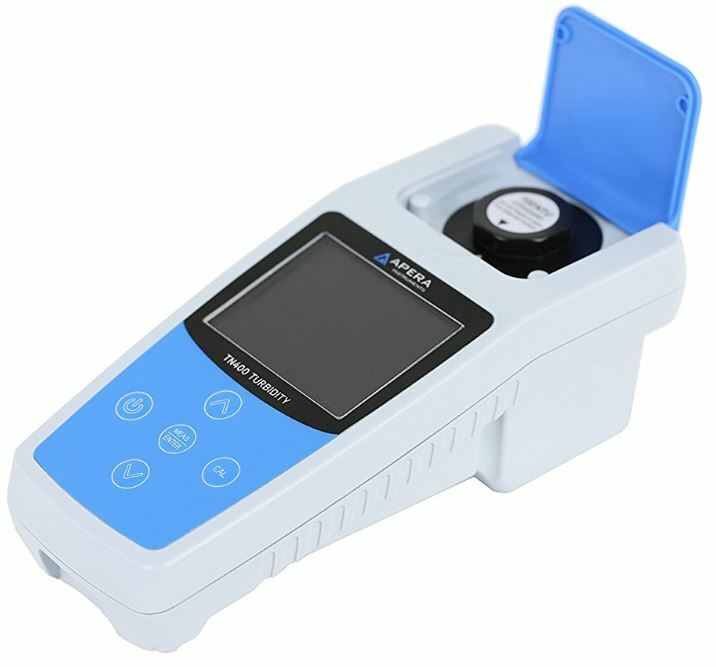 Consequently, turbidity meters are also widely used by organizations who have to report about local environmental conditions, and by environmental research. A turbidity meter operates with a fairly simple light source and lens, which are paired with a detector located at a 90-degree angle from the light. When samples are placed between the light and the detector, the particles suspended within the sample scatter light, and the turbidity meter’s detector determines how much scattering occurred. It then compares those readings to a standard calibration, and you end up with a highly accurate reading of turbidity. 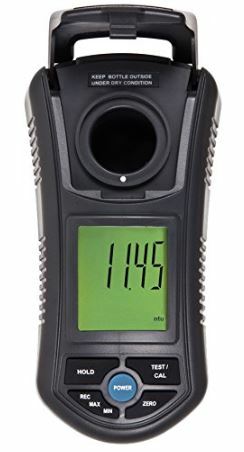 Some turbidity meters are designed to work with a 180-degree angle relative to the detector, which is a preferred design for extremely high precision measurements because it provides better accounting for transmitted light. In other words, the machine doesn’t have to take into account the light that is lost when it’s reflected at a 90-degree angle. For samples with an especially high turbidity, or samples where extreme precision is necessary, 180-degree readings are your best choice. Turbidity is measured by nephelometric turbidity units (NTU), but some organizations use different standards. 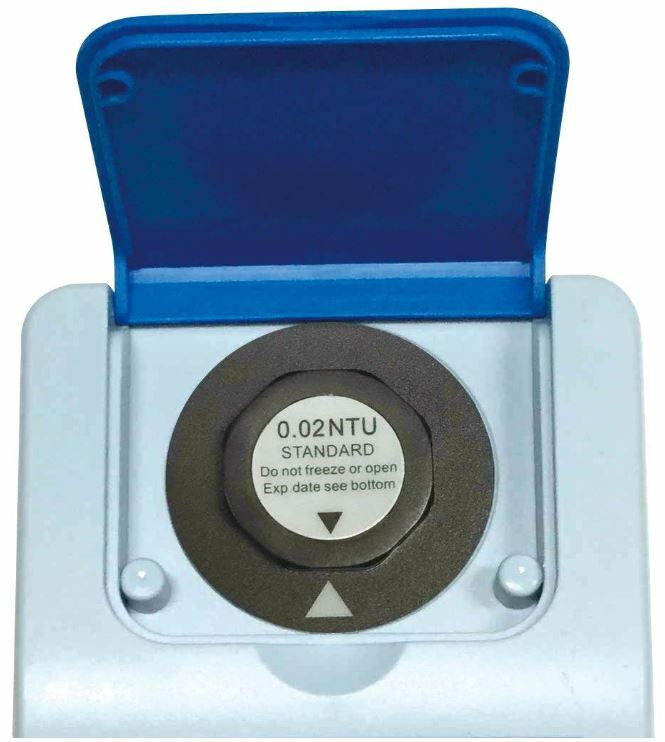 The EPA often prefers nephelometric turbidity ratio unit (NTRU), while others prefer the Formazin Nephelometric Units (FNU) international standard. Even the American Society of Brewing Chemists have their own turbidity measuring standards, known as ASBC-FTU. Clearly, you’ll want to think about which method you’ll be using in your own tests for choosing a meter. If you don’t have specific standards in mind, you should note the most common types of turbidity meters will comply with either the EPA or ISO standards. ISO complaint meters use a very specific wavelength of infrared light, in order to interferences attributed to the color of a sample. These meters also tend to have higher accuracy because they’re aimed at scientific precision rather than practical everyday measurement. EPA-compliant meters must use a tungsten light to offer a precise color temperature. The EPA also requires testing distances not to exceed 10cm, which places some limitations on the kind of devices that can do these tests. Furthermore, the precision of the instrument should exceed 0.02 NTU. Using testers with these standards are great for lower-range measurements, like reading drinking water. Unfortunately, tungsten bulbs are not useful for dealing with colored samples. Among measuring instruments, Sper Scientific is consistently a reliable source of quality equipment. They’re often building some of the best instruments in the industry, from agricultural equipment to centrifuges for chemical laboratories. Amongst turbidity meters, the Sper Scientific 860040 provides everything you expect from a consistent manufacturer like Sper. With that said, the Sper Scientific 860040 is actually one of the most barebones turbidity meters on this list. It uses the quintessentially professional Sper Scientific design, including a slick black exterior composed of hardened plastic. The compact 6.5 x 3 x 2.5-inch just barely build sticks out of one closed hand. On the face of the 8060040, you’ll find a large LED display which loosely resembles a calculator. And like a large calculator, this LED provides exceptionally large and readable figures. Once you’ve crammed in the 6 AAA batteries necessary for operation, it weighs still under 1 pound. All in all, that means the 860040 has a fairly compact and lightweight design. And it’s precisely that greater degree of portability makes the 860040 made suitable for work both in the lab and field. The base of the body consists of just five buttons. A zero button, a test and calibration button, the power button, a hold button for your current measurement. The fifth and final button is used for viewing the minimum and maximum recall turbidity within your measurements, which can be useful when you’re taking several measurements in a row for verification. Sper Scientific 860040 is built to meet ISO 7027 standards, including the use of the nephelometric testing method. To keep measurements accurate over time, it features 3-point calibration. The 8060040 can take turbidity measurements within a range of 0 to 49.99 NTU, with a resolution of 0.01 NTU. And it measures from 50 to 1000 NTU with a reasonably accurate resolution of 1 NTU. Like most quality instruments, the 860040 includes a hard carrying case. The case is also foam lined, making it ready to survive a small impact, and keeping all your gear in place. Within the case you’ll find 0 and 100 NTU calibration solutions, cleaning cloth, distilled water, and an instruction manual. Sometimes taking a measurement is easy, and a simple tool will do the job right. Other times, you’re measuring something a little more difficult. For example, you may be trying to measure a sample filled with turbidity when disturbed, but which rapidly settles when left alone. And for taking on difficult measurements like that, the Hach 2100Q Portable Turbidimeter is perfect. It combines a tungsten filament lamp with laboratory grade optics to create one incredibly portable yet powerful instrument. The Hach 2100Q uses a compact 3 x 4.2 x 9-inch build, loosely resembling a small digital desktop scale. Although its plastic exterior doesn’t look especially impressive, the 2100Q is built with IP67 waterproof protection. That ensures the 2100Q is safe for submersion for up to a meter, for as long as half an hour. Furthermore, the plastic body of the 2100Q has been built to be resistant to corrosion. At the center of the Hach 2100Q, you’ll find a large LCD screen. The display uses a modest 240 x 160-pixel resolution, but provides clear and bright readings from all angles. Along the face of the 2100Q, you’ll find nearly ten buttons. They’re all well-labeled and easy to understand, ranging from navigational arrow keys, +/- value keys, the power key, and three most basic function keys. If the use of a tungsten bulb didn’t already give it away, the Hach 2100Q is built to EPA standards, and supports EPA Method 180.1. The 2100Q makes use of RapidCal calibration, providing you with a single solid standard which is especially suitable for low-level measurements. As a result, the 2100Q provides accuracy within 1% or 0.01 NTU. Testing is performed within ordinary 25 x 60mm test capsules, and the instrument operates with four ordinary AA batteries. From the center console of the device, you can easily place samples for rapid successive measurements. Every measurement includes single-step verification, and the on-screen assisted calibration feature keeps you from having to dig through a manual to figure out what a calibration reading means. The 2100Q is also fairly convenient for data logging. It supports up to 50 measurements in its memory you continue to test. On the backside of the 2100Q, the included USB module can be attached to your PC to export data. Exporting data isn’t an unusual feature for instruments in this price range, but what is unusual is that the data is exported in an XLM format. With the help of a universal format, the exported data instantly readable and useable, on any platform, and all without the necessity of extra software. The Hach 2100Q Portable Turbidimeter includes a one-year warranty, and comes packaged in a hard shell carrying case. Within the case you’ll find silicon oil, an oiling cloth, half-a-dozen sample cells, and 4 AA batteries to help you get started. 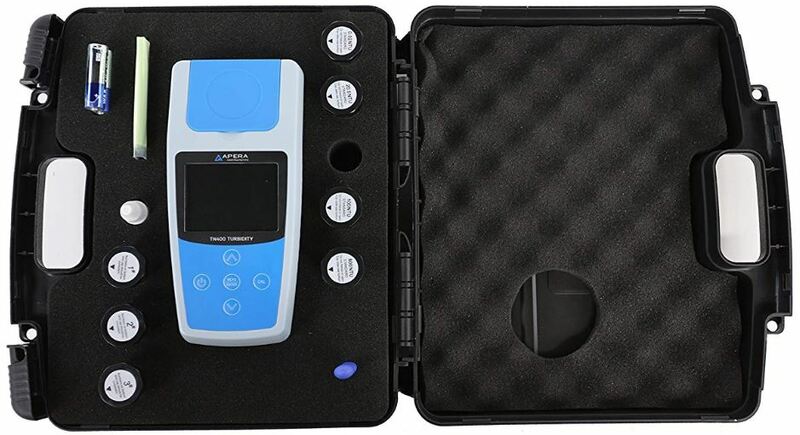 The Apera Instruments TN400 is another turbidity meter that is portable enough to be taken into the field, but smartly designed enough to sit invisibly within a packed lab environment. The TN400 is primarily built around providing data to the EPA, but its highly accurate sensor can be calibrated for the purposes of many types of research. The TN400 uses a highly compact 13.6-ounce build, which isn’t going to slow you down as you move from one site to the next. But you will need to pay attention to its length, due to an exceptionally long 32 x 8 x 3.5-inch design. Fortunately, the TN400 has its weight gracefully distributed across the length of the device while the four necessary AA batteries are in place. Apart from the even weight distribution, you can just about feel of the IP67 waterproof protection on the TN400. The rugged plastic body is clearly quite well sealed, and in your hands, gives off the impression it would easily survive a short fall. More than anything, simple design is what Apera is all about. Their instruments attempt to strike a balance between high accuracy and ease of use. Nowhere is that more clear than in the TN400’s simple 5 button operation. Even people who are inexperienced with using a turbidity meter can get accuracy measurements thanks to the support of a full-color TFT display that can show you measuring progress as it happens. The Apera Instruments TN400 uses a silicon photovoltaic detector, intended to provide an especially high degree of accuracy. That detector is paired with an infrared LED using the ISO standard of 850nm. The result is a wide and accurate measurement range from 0 to 1000 NTU, with readable resolutions between 0.01, 0.1, 1.0 NTU. Those precise readings are matched with repeatability and accuracy under 1% or 0.02NTU. The TN400 is EPA certified, and includes AMCO Clear, which are EPA-approved calibration fluids for turbidity sensors. The TN400 also includes silicone oil to clean testing vials, three sample vials, a cleaning wipe, and a simple screwdriver to replace the battery. It also includes a user manual, but ease of operation is so simple that it’s unlikely you’ll ever have to flip it open. The Sper Scientific 860040 is the inexpensive choice. It’s most distinguishing feature is support for ISO 7027 turbidity standards. For many types of scientific research, ISO 7027 will be a necessity from your testing device. And provided you’re not trying to test anything too difficult, like the turbidity of a substance which settles rapidly, then the Sper 860040 will provide all the testing power you’ll need. Apera Instruments is a midrange turbidity meter aimed at helping inexperienced technicians produce reliable reports for the EPA. It’s built with a heavy emphasis on ease of use. When a turbidity meter is going to be regularly operated by people who haven’t been trained to use it, the Apera TN400 can help ensure human error doesn’t get in the way of accurate measurements. And you don’t have to be inept to enjoy ease of use. Provided the TN400 can do everything you need it to, working with a device so simple is a pleasure, especially for consecutive testing. 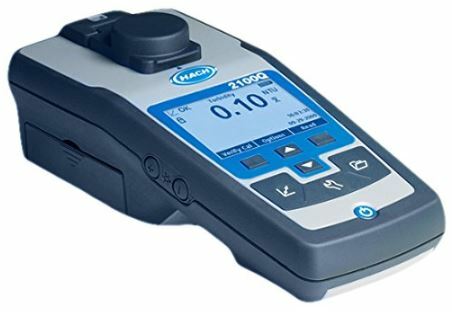 The Hach 2100Q is laboratory grade equipment. It’s also built with the purpose of following EPA standards, but it’s a far more delicate and precise instrument than any other turbidity meter on this list. It’s essentially top-shelf hardware paired with top-shelf software, and made easier with RapidCal calibration to help guarantee steady accuracy across hundreds and thousands of tests. Perhaps best of all, not having to deal with extra software to export the data from the 2100Q makes it an incredibly easy instrument to rapidly integrate into an organization.